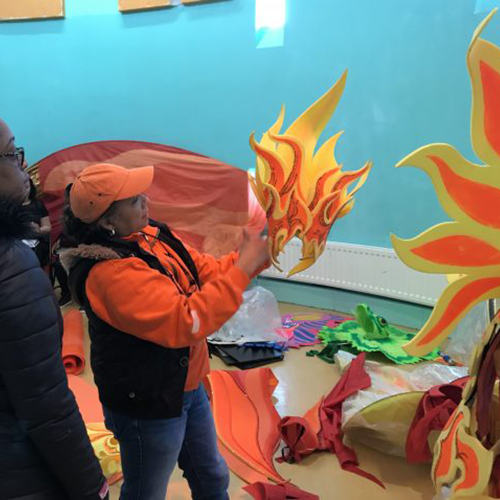 Our Artistic Director Clary talks to local Sheffield artist Karen on her vision of our theme “Rise of the Phoenix” exploring materials, shapes, concepts and of course the children costume pieces being developed. Here’s Hughbon, High Esteem Carnival Designs from Leeds Carnival sharing two of his pieces being assembled here at the Costume Workshop. Can you see another concept of the artform? #GetSheffieldKidsInvolved Join us every Saturday between 5th May – 16th June from 1pm – 3pm at Carver House, Carver Street, Sheffield S1 4FS. Be part of the costumes design process, who knows, you may decide to wear your creation in the parade! We look forward to meeting you!